Sedbergh put in an outstanding display in the final for a 38-5 victory over Dulwich College, who had themselves been exceptional as well, including a victory over Sedbergh in the quarter-final pools. This tournament has been one of the warmest and most enjoyable in years, but it has also been one of the toughest; the quality of sides in this U18 Cup was simply sensational. Any side winning it was going to have to do it the hard way, and so Sedbergh did. Their initial group saw them take on Eltham College, Coleg Llandrillo, Haileybury, and Windsor Boys. By the end of the opening day, ‘have you seen Sedbergh’ could be heard whistling around across all four site venues. This brutal competition does not just give you one group stage, though; it gives you two. The second day beginning with three quarter-final pools. If day one seemed tough, day two was going to be a killer. Sedbergh’s pool contained Dulwich College, Brighton College, and Blundell’s – three outstanding sides. The other two were equally as impressive: Clifton College, Millfield, Hurstpierpoint and Kirkham in one; triple-finalists Cranleigh joined by Hampton St Paul’s Catholic College and Wellington College in the other. The winners would progress to the semis along with one runner up – tension guaranteed before a ball had even been kicked. The key games came in the second round. Cranleigh were pretty much home and hosed as Group 3 winners after 2 rounds, but in Group two, Millfield went from 21-0 up to lose 24-21 against Clifton, handing Clifton top spot. Dulwich College meanwhile stunned onlookers as they beat Sedbergh 12-10, though it was a performance absolutely in keeping with their performances all competition. What it meant was that the runner-up spot was realistically going to be between Millfield and Sedbergh, and boy was it close. Really close. It came down to a handful of points. The key moment for Sedbergh came at the death against Brighton College. The call from Brighton came to kick it out but when the kick came it was a sky shot. Sedbergh gathered it and scored; in the end, the vital try that would just give them the edge. Millfield still had their chance though. With seconds to go against Hurstpierpoint they were in the semi final, only for Hurstpierpoint to score. How fine the margins; how tough the competition. The semi finals were less tense, but no less challenging. Nonetheless a fast start from Sedbergh saw them claim a 24-5 victory over the side they beat in last year’s final – Cranleigh – while Dulwich College beat Epsom in a cracking game 28-19. So to the final, where there was already a sense building that Sedbergh were annoyed with themselves for losing to Dulwich in that quarter final. They came flying out of the traps, showing the same intensity in defence that had been their hallmark for two days, and that clinical edge in attack that separates them. Two minutes in, George Barbour had opened the scoring for them, with skipper Tom Curtis, a magician across the two days, converting. Barbour then crossed for a wonderful second shortly after with Curtis nailing the conversion and suddenly 14-0 looked like a long road back for Dulwich College. That road got longer shortly before half time when the magnificent Will Panday, another player of the tournament contender for many, crossed for a 19-0 lead. Ollie Melville then stretched things even further, doing twin brother Cam proud after his injury earlier in the tournament. At 24-0, the game really was done, yet Dulwich had done little wrong. They were just being stretched to breaking point at the end of a very very long two days of rugby in unseasonable, but welcome, heat. Sedbergh just kept on coming though, relentlessly, and how. Curtis turning on the magic to ghost through a gap before throwing the blind offload to Will Haydn-Wood for the score. With Curtis converting, Sedbergh were now a stunning 31-0 ahead. However, this Dulwich side does not know the meaning of giving up, and certainly not on a stage like this. They kept coming and kept coming and eventually got their reward through a score from Isaac Gleave. If you thought Sedbergh might shut up shop after that though, you would be mistaken. The touchlines were imploring them to keep it safe, but not this group, not with back-to-back glory on the line; they wanted to finish it in style. Boy, did they. Will Panday scoring his second of the game to send the sizeable home support absolutely bananas on the touchline, sealing the 38-5 victory with Curtis’ nonchalant conversion. They were, quite simply, sensational. Over the two days, only the most die-hard of people from other schools would argue that this group were not the standout group. Just winning once at Rosslyn Park is immensely challenging, but to do it back-to-back, and in a year as tough as this, is utterly sensational. The names of Haydn-Wood, Panday, Manihara, Wrankin, Barbour, Lanni, Bundage, McGhee, Shiel, Cooke, Brighetti, the two Melvile’s, and skipper Curtis can now add themselves to the list of Sedbergh legends of Rosslyn Park. A word on Dulwich College though, who were magnificent throughout this tournament too. Over both days they gave everything for their shirt and quite simply could not have given more, both physically and mentally. They can rest easy, knowing that despite the pain of defeat, it was to a side that were just the pick of the bunch. Eventually, when all was said and done it was Coleg Sir Gar who took it, beating Dean Close 26-17 in a magnificent final. There was plenty of tension: a late Dean Close try had people wondering if a dramatic comeback might be on, but this excellent Sir Gar outfit – and they had been superb throughout the day – sealed the title and deservedly so. There had certainly been twists and turns along the way though. Like in the Cup, it was points difference that decided who would be the last of the semi-finalists between Denstone College and Northampton School for Boys, Northampton just edging it and then only just missing out on the final, losing 31-28 to Dean Close. Sir Gar were the class act though, topping Group 1 before beating Warwick 32-19, and then a performance full of power, pace, and energy to beat Dean Close in the final. Ultimately though, the day, indeed the tournament was about these young men in Brown. 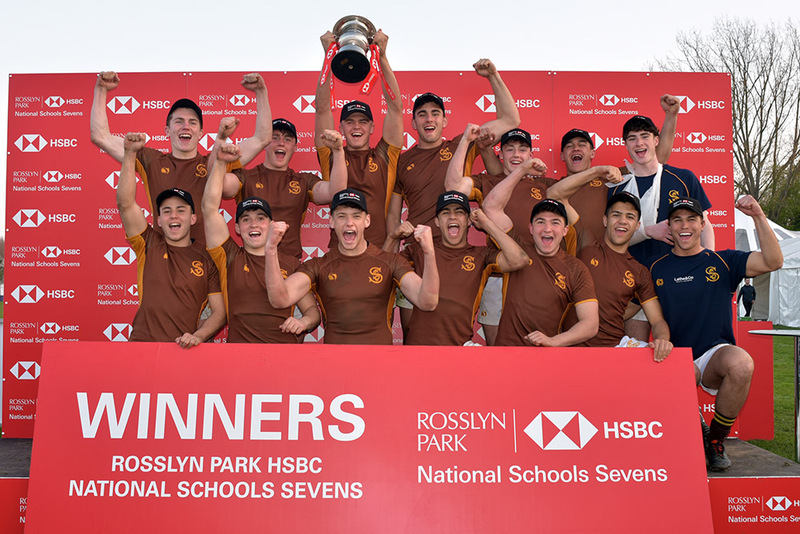 Schoolboy titles are hard to come by, Rosslyn Park ones even more so. Just have a read through the honours list in the programme; very few players ever get the chance to lift this famous old Cup. The touchlines were littered with pros and ex-pros all week, but very few of them have ever had this particular piece of silverware. It isn’t about the Cup though, or the achievement, or the individual awards, though all are obviously outstanding. It is about the who and the how; it is about the fact that it is alongside your mates, the people you are with and choose to be with day in and day out; it is about how hard you have to work, not just in preparation, but at the event itself. All the action on the 2 showcase pitches was broadcast live throughout the week. You can view the full coverage on our YouTube channel.